In 1973, Kendo became incorporated at the dojo when Iwakabe Sensei became acquainted with Mr. Umemoto, Hiroshi, Kyoshi-7th Dan Kendo instructor. Under Umemoto Sensei’s guidance, Iwakabe Sensei organized the Rocky Mountain Kendo Federation. With Umemoto Sensei as chief instructor, Iwakabe Sensei soon became an assistance instructor for Kendo. 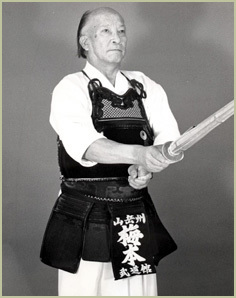 In 1975, Iwakabe Sensei returned to Japan to study Iaido from Master Danzaki Tomoaki, Hanshi-9th Dan. Two years later he began Iaido classes at Rocky Mountain Budokan that continues to this day. RMKIF is a member of All United States Kendo Federation with its headquarters in Englewood, Colorado at Rocky Mountain Budokan. Rocky Mountain Budokan is affiliated with the International Kendo Federation and the All United States Kendo Federation. Includes dojos (schools) in Colorado, Nebraska, New Mexico, Utah and Wyoming. View listing of dojos. Photos of iaido and kendo students may be seen in our photo gallery.